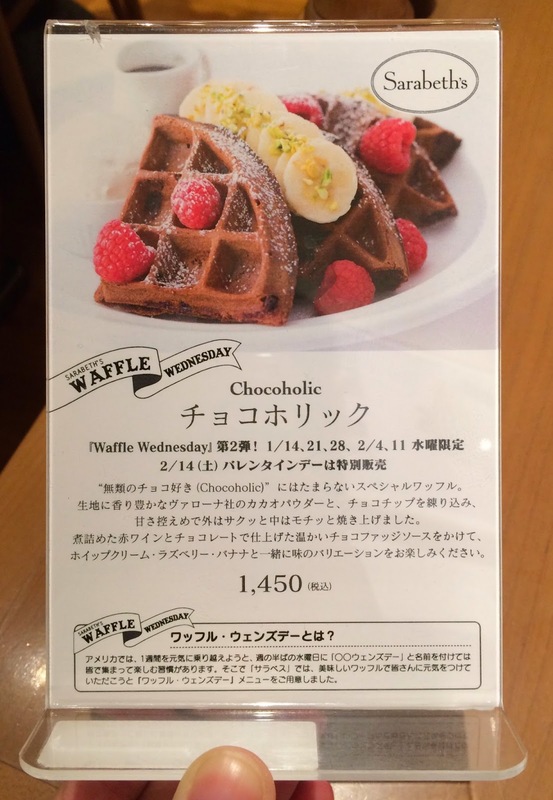 As I learned that Sarabeth's started "Waffle Wednesday" which to serve chocolate waffle called "Chocoholic" on January 14, 2015. This promotion is held every Wednesday and will be available till February 11, but also on Valentine's Day, they serve even though it's not Wednesday. 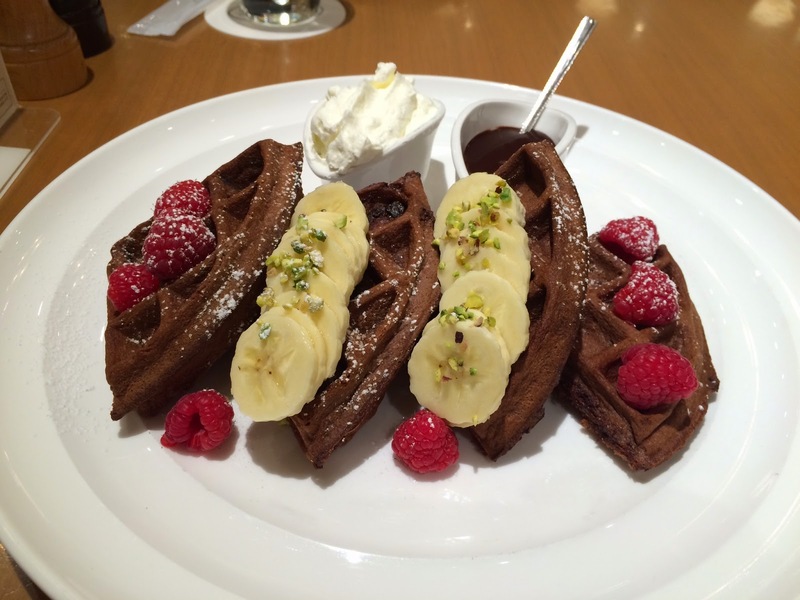 Today, it's Wednesday and all the branches in Japan serve "Chocoholic," a special waffle plate, so I went to the closest branch at Shinjuku Lumine 2. 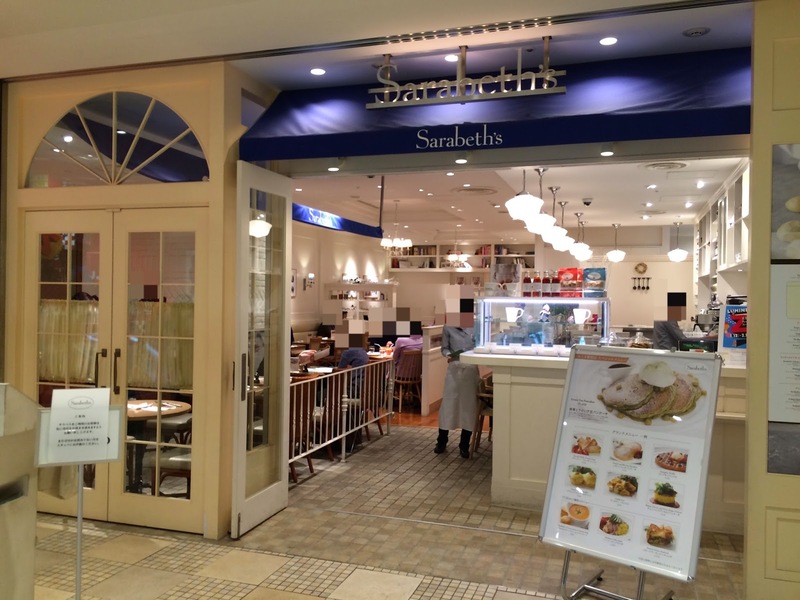 Shinjuku Lumine 2 opens at 11 AM, but Sarabeth's opens at 9 AM. Before Lumine 2 opens, there's an escalator directly going up to the restaurant, and the escalator is right next to KIOSK, a mini conbini with orange light, by JR Shinjuku station South Exit. 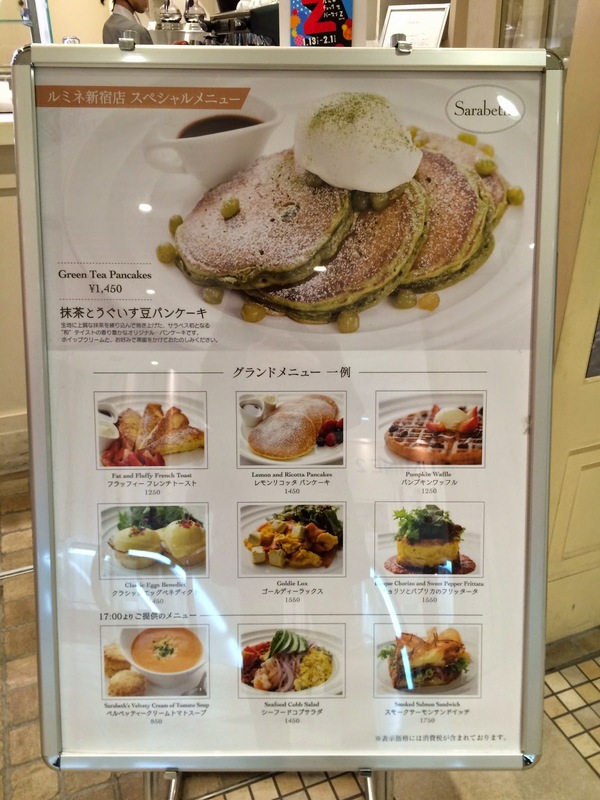 At Shinjuku branch, they had its own special menu, "Matcha and Uguisu-Mame Pancakes." * Uguisu-Mame is sweetened green peas, and mame means "beans." I got there at 9:10 AM and was told the time restriction was 70 minutes. The restaurant was 30% full and there're empty tables but they said it'd take 5 minutes to let me seat. I was seated at 9:13 AM, without looking at menu, I ordered Chocoholic. At 9:24 AM, my Chocoholic was brought. 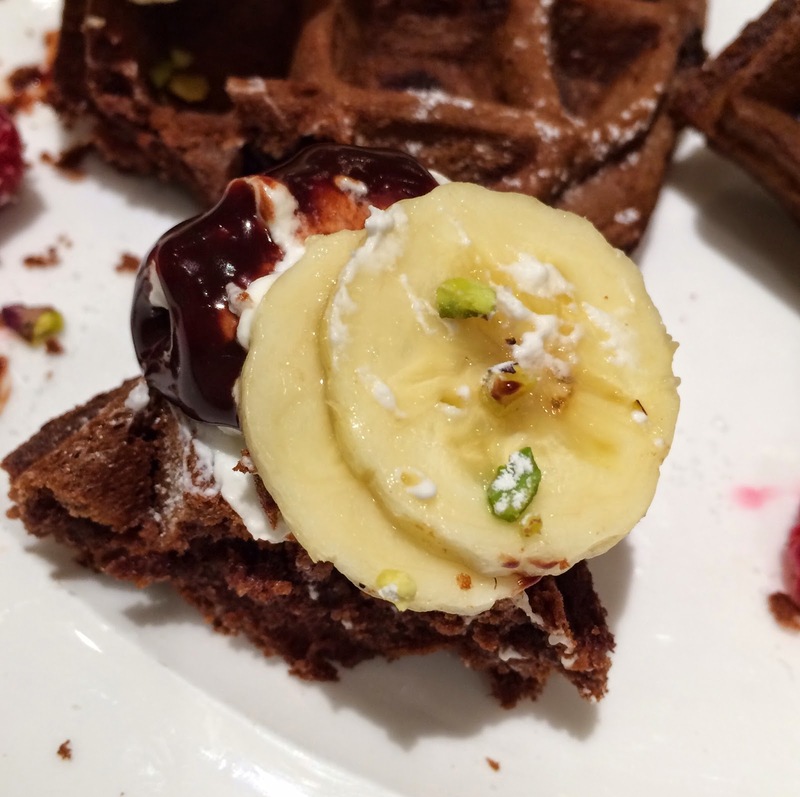 Over 4 chocolate waffles, there're raspberries and sliced bananas with chopped pistachio. 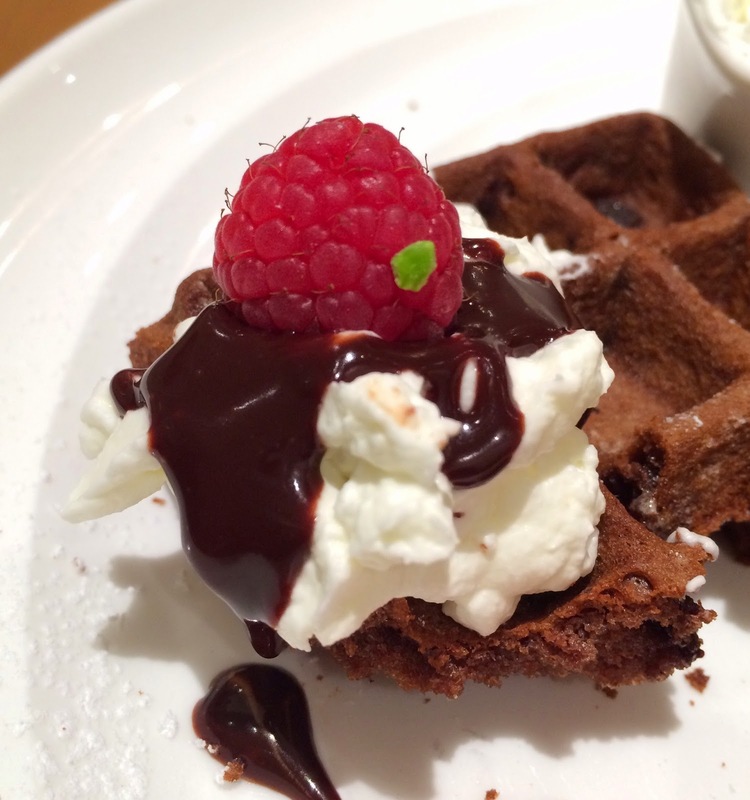 There're whipped cream and chocolate sauce. Whipped cream was sweet and beaten to firm peak, and chocolate sauce was a bit bitter. 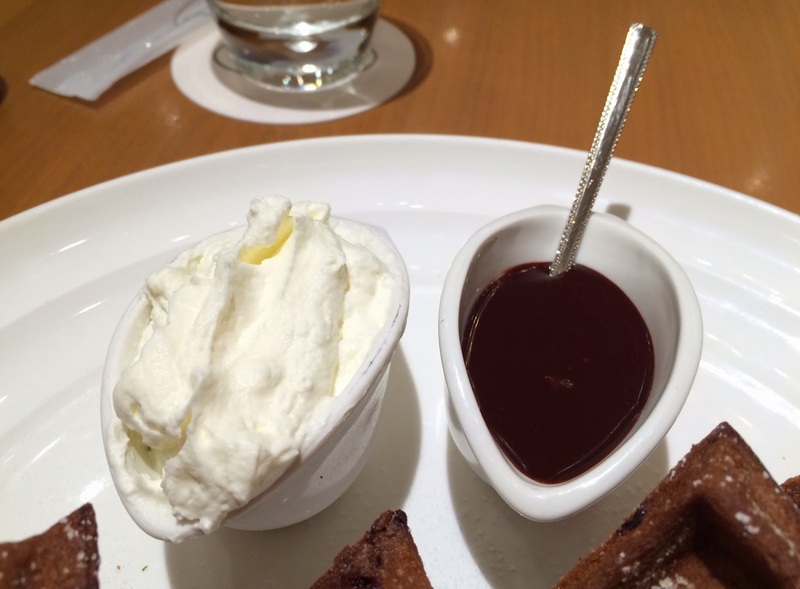 The chocolate sauce was made with red wine, but it didn't have alcoholic odor. 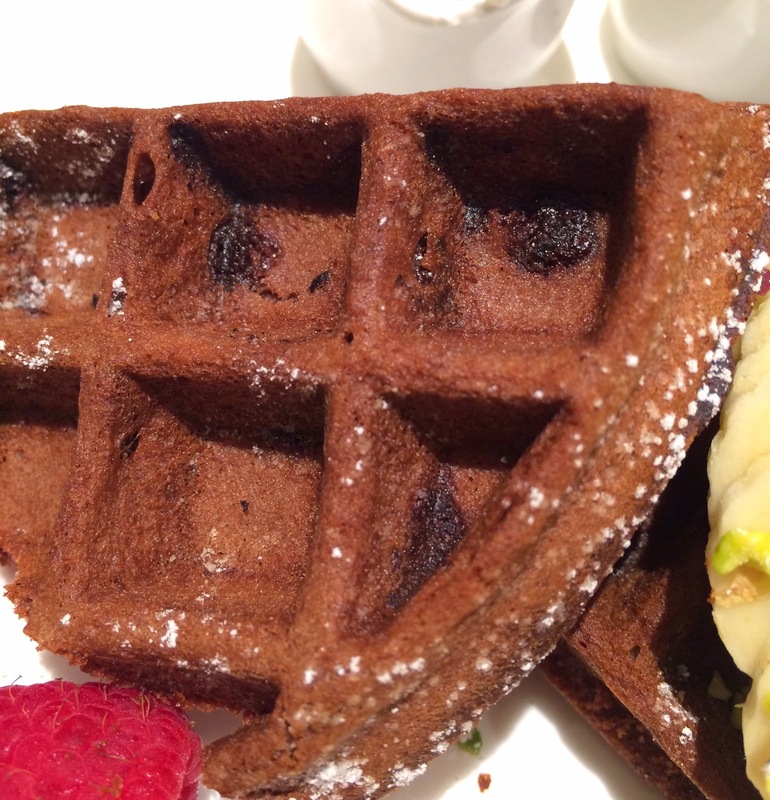 The waffle was really crispy and crunchy outside, and I heard the flaky sound when I cut it with a knife. 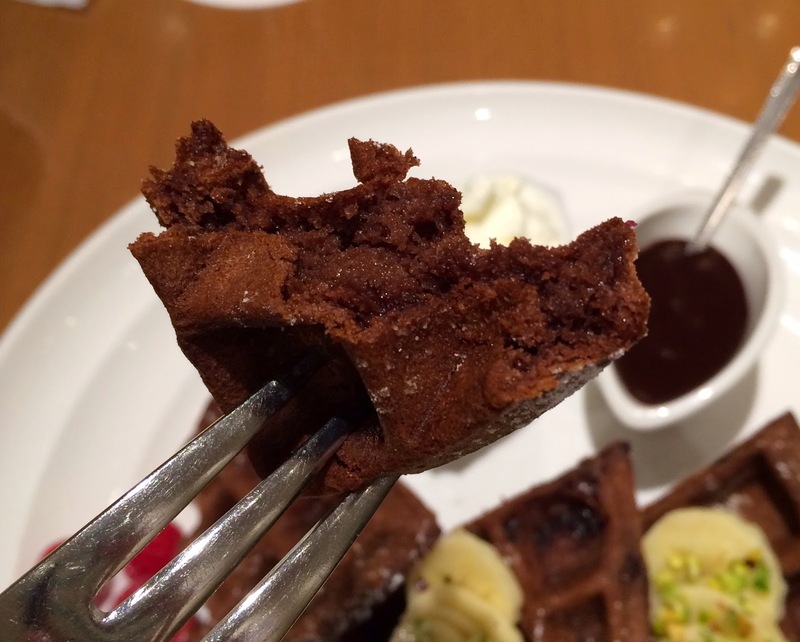 Inside was moist and the waffle was fully chocolate colored and flavored. 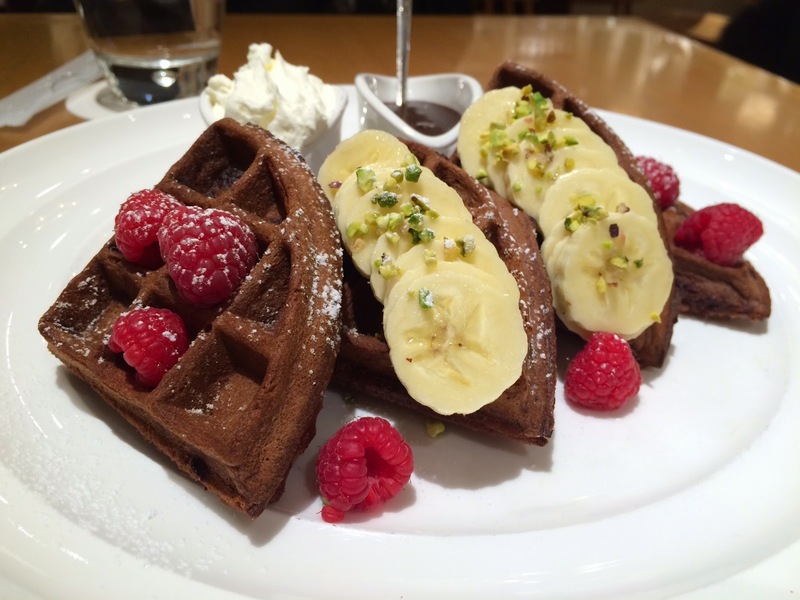 Also I saw some chocolate chips, and the waffle itself was lightly sweetened. With a raspberry, whipped cream and chocolate was sweet and sour, and refreshing. 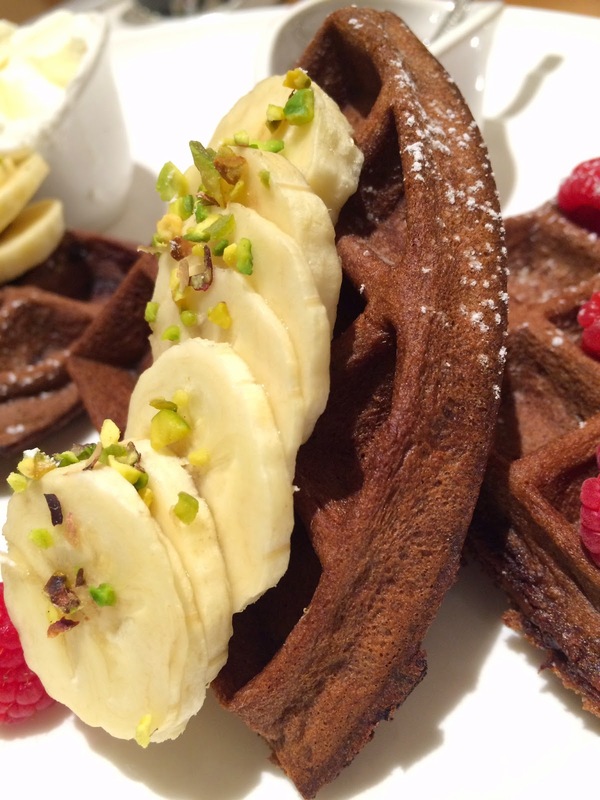 The bananas were thinly sliced so that it's easy to eat with waffles. 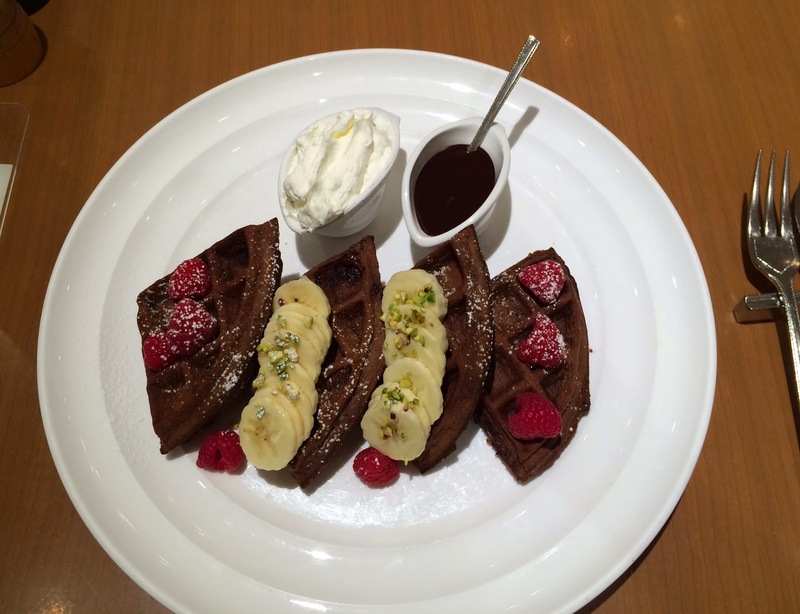 These waffles weren't sweet so that I enjoyed all the 4 pieces. When I was about to pay, I walked to the front cash register by the showcase, then an employee in the counter shouted to me, "There, there" instead of a full sentence, "The cash register is over there." I was annoyed by the way she acted (shouting and ordering me), but I proceeded the way she pointed with her chin, then she shouted again, "Here, here!" as I walked pass by the cash register she meant. To be treated like a kid or even an animal by an employee while I'm a customer, I couldn't accept it and asked another employee if she's Japanese or not, then she said she was, so I said to her that the employee in the counter had better learn how to talk to customers. Then she, who was innocent, apologized but the one who kept shouting at me didn't. Like an old proverb, "All's well that ends well," the idiot just ruined my happy time with tasty waffle by the way she talked and pointed the way with her chin. Never will I be back there. Other reviews of Sarabeth's are below. I read your review before coming here so I kinda anticipated a bad service (Shinjuku branch is the closest to where I was so I decided to come here) but the service was okay today, maybe they have given some moral discipline to the server? I was hoping the pancake would be similar to fondant chocolat (lava cake), but I was a bit disappointed also when I saw the mushy chocolate sauce inside. I sent an e-mail about the service to the managing company and they replied to me within day updating me what they did after reading my email, and they even found out who that employee was, so that by the time you went there, they must have heard or been trained again. I know right! It would have been so much better if they are filled with melting chocolate! That was a fast response from them. Good to know that! Could't agree more with Daikanyama shop! Best place out of 3! I'm thinking to recreate the pancake and see how hard it'll be to make a pancake with fondant chocolat feature. Yeah, the response was really fast. 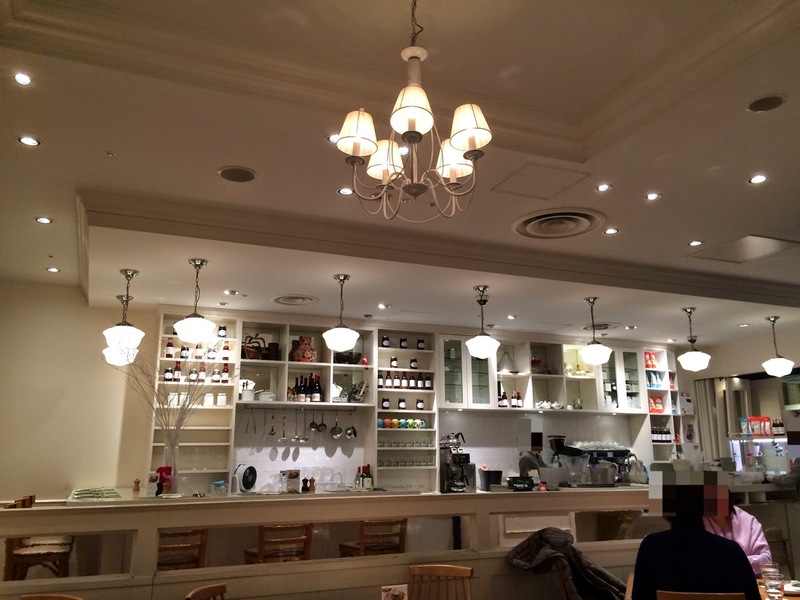 I've never been to Shinagawa branch, but how was it? Is it similar to Shinjuku? I bet that would taste heavenly!! I think I need to create a tall pancake so that it can hold enough chocolate sauce in the middle and also keep it runny. Shinagawa brach --- thank you for the detailed description. If I go that area, I may give it a try, but (unfortunately) the closest one is Shinjuku whenever I go back to Tokyo... 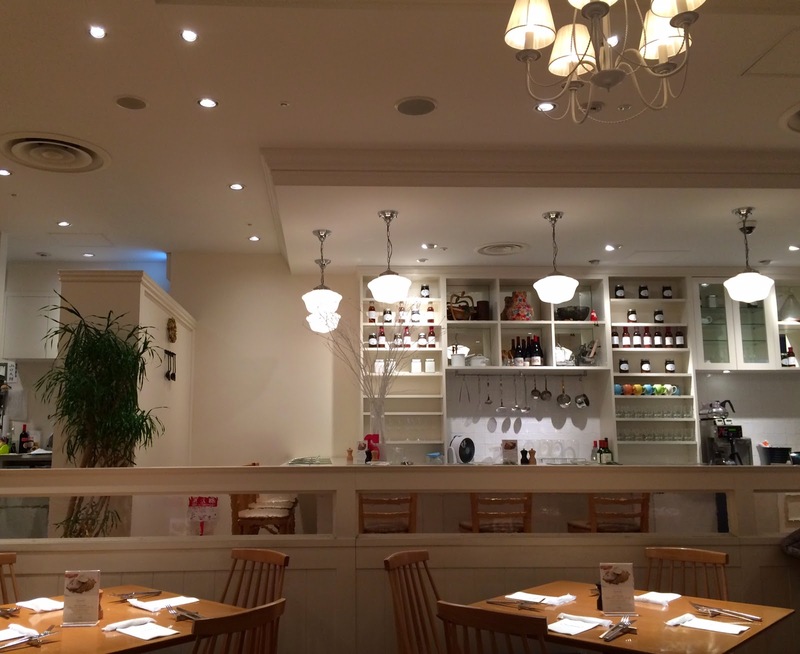 But Daikanyama's is worth traveling with the sunlight and relaxed atmosphere.